I need to replace the front derailleur on my tadpole trike. Unfortunately, I cannot find a brand name or other numbers anywhere on the derailleur, so I cannot just replace it with an identical product. When looking at new items, they have many numbers and measurements which I do not understand, so I do not know whether I will be buying one that fits. The back derailleur is an 8-gear Shimano Deore. The other bike parts appear to be in metric. The post that the derailleur clamps onto measures 28 mm in diameter. What details do I need to look for to know that a replacement will be the right size for this bike? That means you can use pretty much any (Shimano) mountain bike triple front derailleur that fits. The main consideration for you will be how to mount the front derailleur. If you're using a clamp mount, you have to have one that can fit the tube where the derailleur mounts (the 34.9mm in the examples below are the seat tube thickness but many times the derailleur will come with a variety of clamps and shims to match different tube sizes). If you have braze-ons, they need to fit the braze-ons. The other consideration is where the cable pull comes from (from the top or bottom of the derailleur as it would be normally mounted on a standard bicycle). Many front derailleurs allow for pull from either direction (dual pull) but some like the SRAM below are "top-pull only" or "bottom-pull only." Not the answer you're looking for? 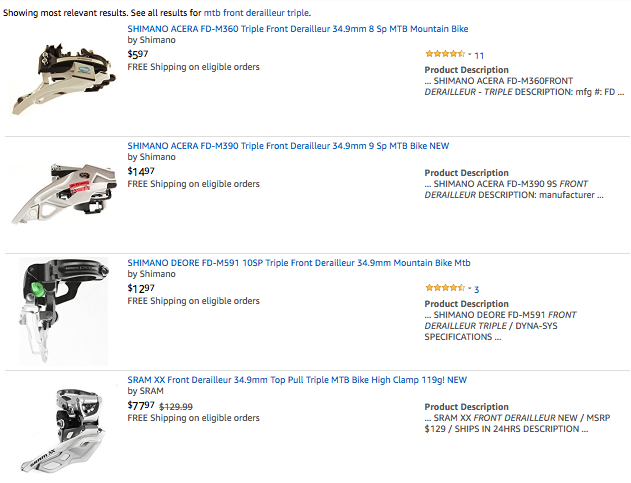 Browse other questions tagged derailleur recumbent tricycle derailleur-front or ask your own question. What can be used to replace a Shimano 105 5600 long-cage derailleur? How to prevent my front derailleur from rubbing on my back tire? Can I install a front derailleur for my bike? What is the meaning of multiple front derailleur clamp measurements? How can I stop an Adult trike when both front brakes fail? How can I fit a bigger rear tyre when limited by the front derailleur?